Overland Park based Shear Madness Franchising announced today the opening of additional locations in the Houston Texas and Orange County California markets. 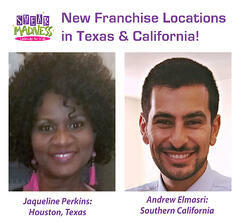 Jacqueline Perkins of Humble Texas and Dr. Andrew Elmasri of California Children’s Salons LLC will become Franchisees in those markets with locations opening this fall. Shear Madness Franchising LLC, was founded in 2010 to expand the Shear Madness Haircuts for Kids concept that was originally opened by Paula Thurman in 1997. Combining the magic of childhood with haircuts, parties, salon services and a fantastic kids boutique filled with toys, hair products, jewelry and more, Shear Madness currently has franchise locations open in Kansas, Missouri, Texas, Iowa, New York and New Mexico. For additional information contact Jim Otto, Director of Franchise and Corporate Development, jim@shearmadnessfranchising.com. Are you interested in learning how YOU can join the Shear Madness Haircuts for Kids family and run your own successful small business? We are one of the fastest growing kids hair salon franchise systems in the industry today! If you would like to learn more about small business marketing, great marketing strategies, resources for small businesses, business tips, how to grow a small business, or how to become a successful owner of your own kids hair salon franchise business, please click below or call 1-888-98 GONE MAD!